Joint compound makes a smooth wall out of a series of drywall panels. If you live in a house or apartment in North America, it's safe to say you have mud on your walls. Not the kind in the puddles outside, but drywall joint compound, for which drywall pros use the mucky nickname. 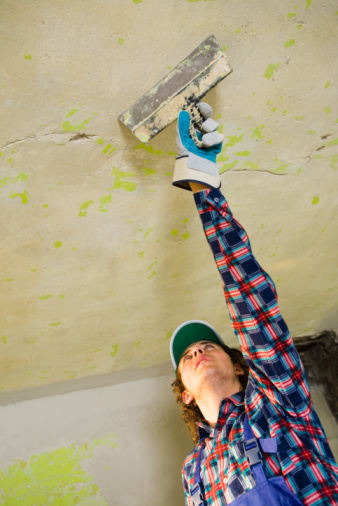 Unlike the outdoor variety, drywall mud has a specific composition, and it comes in different "flavors". For example, a typical home may contain all-purpose mud, topping compound and perhaps even a certain amount of hot mud. After drying, the different types of mud are indistinguishable to the eye, but they aren't the same. Texture and workability vary from one type of mud to another, and certain varieties are better for particular drywall applications than others. It's important to know what you're working with. The core of a sheet of drywall consists almost entirely of gypsum, an abundant mineral classified by the United States Geological Survey as a perpetual resource. This mineral, which is also known as hydrated calcium sulphate, along with limestone (also known as calcium carbonate), are the main ingredients in joint compound. Other ingredients include attapulgite (a needle-like clay composed of magnesium-aluminum silicate), mica, perlite and starch. Some types also contain a vinyl polymer to promote smoothness and workability. None of the ingredients are considered hazardous, although attapulgite has been shown to cause cancer in laboratory animals under conditions unlikely to exist during normal use of the material. Joint compound flavors, denoted by colored container lids by United States Gypsum, the company that markets the Sheetrock brand, differ in the proportions of these ingredients. The flavors fall into two categories: those that "set" and those that dry solely by evaporation. Setting types, which drywall pros call hot mud, contain a preponderance of gypsum, which is the main ingredient in plaster-of-Paris. Drying types are mostly limestone. Taping compound is designed for the first stage of drywall finishing. The number of available choices makes can make buying joint compound a little bewildering for the drywall novice. Besides all the different flavors of pre-mixed products, you also have your pick of a number of powders that you have to mix yourself. Pros tend to use the powdered products because it gives them more control over the final consistency, but that's not the only reason. Powdered products are easier to store, and they don't collect flecks of dried material that can cause headaches when spreading the compound. Taping compound is a heavy-duty mixture high in limestone and clay. It is a drying compound, and it has very good adhesion, but it's more difficult to smooth out than other varieties. This is the best material for setting drywall tape. Topping compound is another drying type that pros use for the final finish coat. It contains mostly limestone but has a higher concentration of talc than other products, and it may contain vinyl polymers. It's very workable and easy to sand. This is the best mud to use for texturing. All-purpose compound combines the durability of taping compound and the workability of topping compound. You can use this product for all stages of drywall finishing—even texturing—and many people do just that. Setting compound, or hot mud, is composed mostly of gypsum, or plaster-of-Paris. This product hardens faster than drying products, but the hardening process is irreversible. Drywall pros use it to speed up the overall finishing process. Because it's generally harder to sand, mistakes are harder to fix, so it should be used with caution by novices. Properly mixed mud has the consistency of peanut butter. You can usually use ready-mixed mud right out of the container, but if you're using an older batch, you may want to remix it. Mixing is a necessity when using a powdered product. The consistency for which you're aiming is that of thick honey or peanut butter. The mud should be soft (very important) but not runny. It should form a mound on your drywall blade and stay in place when you tip the blade about 45 degrees. When mixing hot mud, which always comes in powdered form, note the setting time marked on the bag and mix only the amount you can use in that length of time. Any extra will harden in your trough and on your tools. Hardened mud is difficult to remove, and even if you manage to salvage some, it will be unusable.